This meant that Jackson Canter only actually accounted for 2% of the total indexed pages on the QS domain, despite being one of the largest firms. Sharing a domain with so many firms, each offering similar competing services, limited the brand’s on-page SEO effectiveness, causing significant ranking limitations in search engines. In effect, Jackson Canter were competing with their own site (but different law firms) for ranking positions in search engines like Google and Bing. 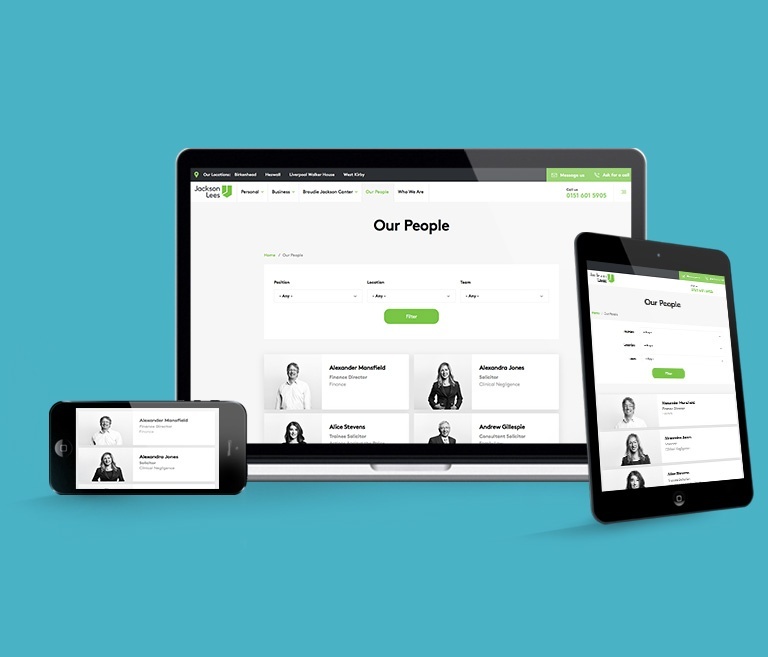 We needed a strategy to increase their traffic whilst retaining their branding and website. It was important to maintain their relationship with QualitySolicitors (QS), as being hosted on the QS site was a mutually beneficial position: QS would refer leads to Jackson Canter and provided an online platform for users to convert on. 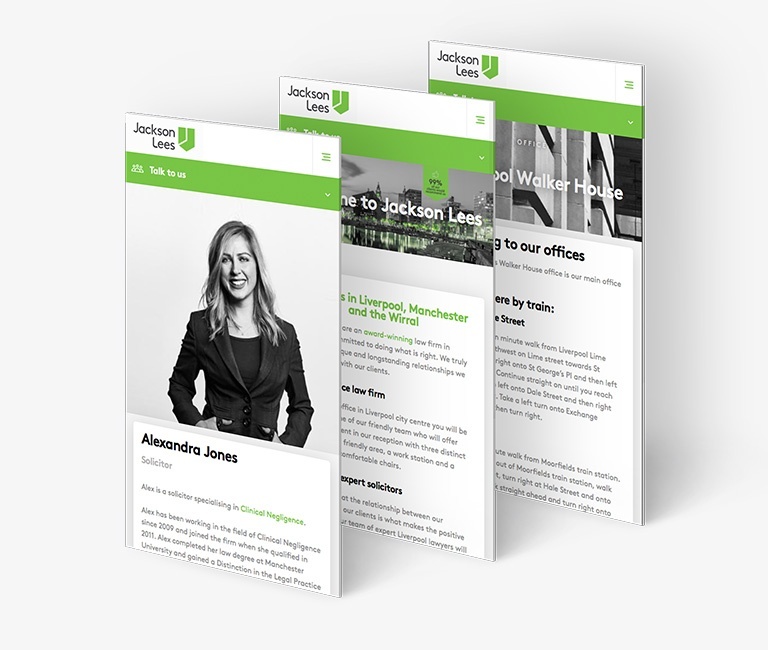 Our brief also included increasing traffic and enquiries to sister site and law firm Broudie Jackson which also utilised the same template and CMS as all QualitySolicitors sites. It was important to distinguish the two firms, whilst retaining the community care element which was at the centre of the Jackson Canter Group ethos. A clear on-page content and messaging strategy was required to ensure that traffic was directed to the relevant site. As such, the key business goals were to increase traffic and to differentiate themselves from their sister site, whilst maintaining the familiar ethos. The first priority was to oversee a domain migration, from www.qualitysolicitors.com/jacksoncanter to www.jacksoncanter.co.uk. Redirect pathways were put into place to ensure that users searching for the old site could find the new website. As a result, QualitySolicitors pages soon began to drop out of the search engine index, replaced by the new Jackson Canter domain. Providing placeholder pages on the QualitySolicitors site, featuring details of services offered, allowed us to direct users to the appropriate new domains. To prevent the two sites from encroaching on the organic visibility of the other, we applied cross-domain canonicalisation. Our efforts assisted search engines in determining the most relevant page to rank, whilst we were still able to provide a conversion path for visitors on both sites. The next stage of the campaign focused on revising the on-page content to focus on user intent and search behaviour. As the services offered by solicitors are often represented by complex language, it was noted early on that not everyone in need of legal support would know exactly what service area they required, or how to find it. Workshops with 10 heads of departments were organised. Within these discussions, we identified business priorities for the coming year and common questions asked by new clients. This information was then used to conduct keyword research for each legal service area. New content was produced for the site in a collaborative manner with the solicitors. 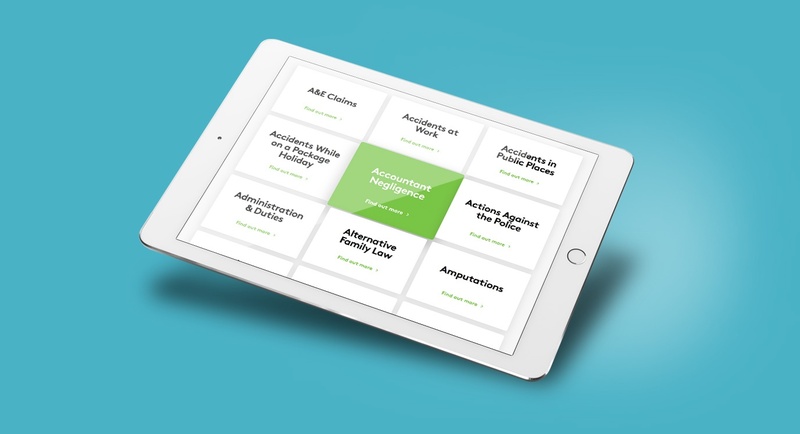 This approach combined common search queries with legal expertise; we were able to ensure content on the site was legally accurate whilst also representing the intention and behaviour of those in need of legal assistance. The campaign involved two different brands that were superficially very similar: Broudie Jackson Canter and QualitySolicitors Jackson Canter. In order to ensure that customers found the service they required, no matter which site they landed on, we implemented a large-scale technical SEO plan. We provided placeholder pages featuring details of services offered from each brand, recommending that they visit the appropriate site for further information. However, this solution meant that the two sites could be encroaching on the organic visibility of keywords for the other brand. In order to prevent this, we implemented cross-domain canonicalisation, with the placeholder page on QSJC canonicalised to Broudie and vice versa. Our canonicalisation efforts assisted search engines in determining the most relevant page to rank, whilst we were still able to provide a conversion path for visitors on both sites. Connecting separate subfolder brands under the same domain allowed us to futureproof the site, allowing logical locations and structure for any further acquisitions. The infrastructure can be easily built upon, including further brands if required in the future. Jackson Lees can continue to grow, without the fear of facing another large-scale digital migration or merger. Once the new domain had been fully indexed, we soon saw a significant increase in traffic, with January 2016 recording the most organic traffic had ever received: a 29% increase from Jan 2015. New organic traffic records were set 7 times in the following 10 months. SEO was just one of three campaigns we delivered for Jackson Lees. You can read about the Website Build and Paid Advertising campaigns also.